The knowledge about the quality characteristics (QoS) of service compositions is crucial for determining their usability and economic value; the quality of service compositions is usually regulated using Service Level Agreements (SLAs). 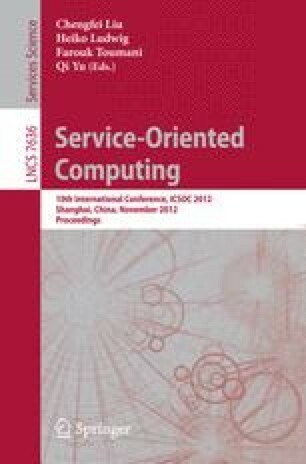 While end-to-end SLAs are well suited for request-reply interactions, more complex, decentralized, multi-participant compositions (service choreographies) typically need multiple message exchanges between stateful parties and the corresponding SLAs thus involve several cooperating parties with interdependent QoS. The usual approaches to determining QoS ranges structurally (which are by construction easily composable) are not applicable in this scenario. Additionally, the intervening SLAs may depend on the exchanged data. We present an approach to data-aware QoS assurance in choreographies through the automatic derivation of composable QoS models from participant descriptions. Such models are based on a message typing system with size constraints and are derived using abstract interpretation. The models obtained have multiple uses including run-time prediction, adaptive participant selection, or design-time compliance checking. We also present an experimental evaluation and discuss the benefits of the proposed approach. The authors were partially supported by Spanish MINECO project 2008-05624/TIN DOVES and Community of Madrid project P2009/TIC/1465 PROMETIDOS-CM.